Tired of the pace and noise of life near London and longing for a better place to raise their young children, Mary J. MacLeod and her husband encountered their dream while vacationing on a remote island in the Scottish Hebrides. Enthralled by its windswept beauty, they soon were the proud owners of a near-derelict croft house—a farmer’s stone cottage—on “a small acre” of land. Mary assumed duties as the island’s district nurse. Call the Nurse is her account of the enchanted years she and her family spent there, coming to know its folk as both patients and friends. In anecdotes that are by turns funny, sad, moving, and tragic, she recalls them all, the crofters and their laird, the boatmen and tradesmen, young lovers and forbidding churchmen. Against the old-fashioned island culture and the grandeur of mountain and sea unfold indelible stories: a young woman carried through snow for airlift to the hospital; a rescue by boat; the marriage of a gentle giant and the island beauty; a ghostly encounter; the shocking discovery of a woman in chains; the flames of a heather fire at night; an unexploded bomb from World War II; and the joyful, tipsy celebration of a ceilidh. 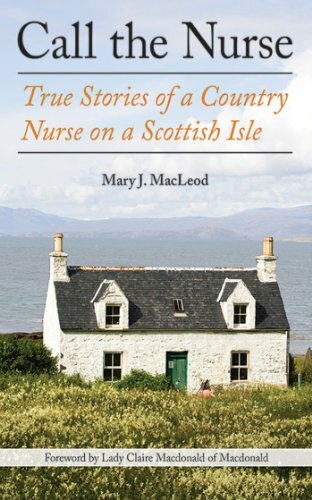 Gaelic fortitude meets a nurse’s compassion in these wonderful true stories from rural Scotland.